Woohoo! I'm always excited to post about exclusive preorder bonus items from Singapore. GameMartz and Scenic Multimedia just posted this up on their Facebook Page. According to GameMartz, these are the exclusive preorder bonuses from the local supplier. So all retailers who get their copies from the local supplier should be getting this. Of course, this could also mean other countries in the region will get the similar preorder bonuses. (Singapore is too small to warrant a truly exclusive item). But still pretty cool! I think I saw that a Philippines store also having the bottle opener as a preorder bonus. 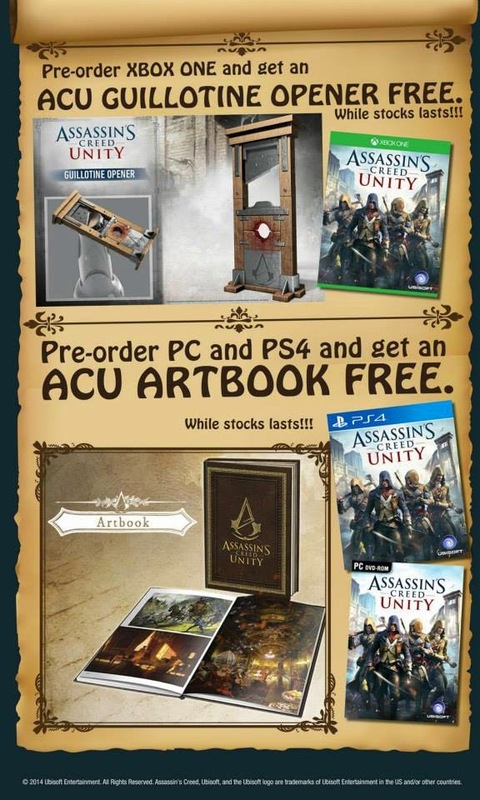 Still no news about any Asia Collector's Edition or AC Rogue preorder bonuses though, but stay tuned..